I would like to share with you a fun project that I'm working on. Cassie at You Go Girl is hosting a crochet-a-long. 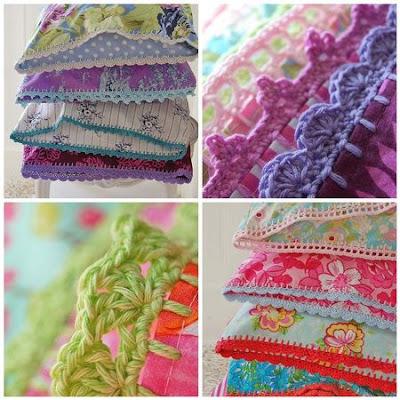 We are learning how to make these gorgeous pillow cases. The ones above are from Rosehip. These are so pretty! I have never crocheted before. I took a rag knitting class once and by the time I was finished I was so sick of that sweater I gave it to my sister.LOL! I'm gonna follow along though. 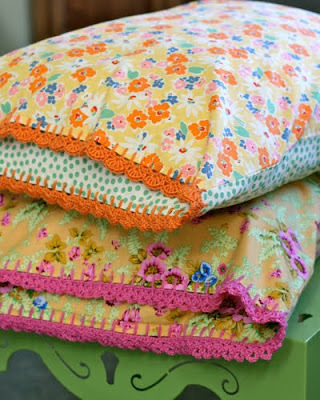 I really would love to do some pillowcases. Those are Fantastic!....beautiful and bright! Hi, Renee! Thanks for coming by my place! I like the colors on your blog, too! GORGEOUS!! These make me happy! The pillowcases are fresh and fun. My daughter Lydia is making some, I told her I should have that button on my blog for her sake! Beautiful! What a way to dress up a pillowcase. I'm doing it too. I hope to start on my pillowcases today. I've been practicing my crochet and have rediscovered that I CAN crochet single and double stitch!